Celonis has been helping companies analyze and improve their internal processes using machine learning. Today the company announced it was providing that same solution as a cloud service with a few nifty improvements you won’t find on prem. 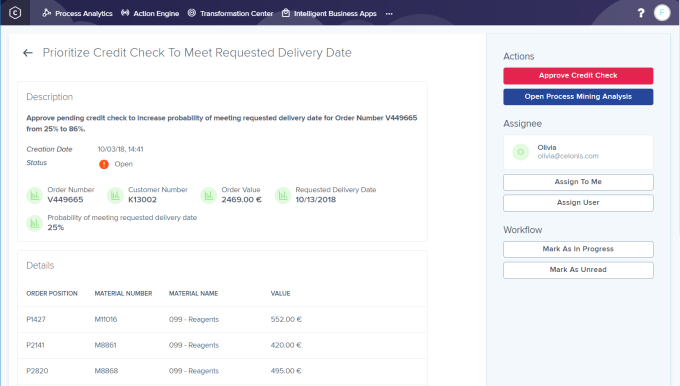 The new approach, called Celonis Intelligent Business Cloud, allows customers to analyze a workflow, find inefficiencies and offer improvements very quickly. Companies typically follow a workflow that has developed over time and very rarely think about why it developed the way it did, or how to fix it. If they do, it usually involves bringing in consultants to help. Celonis puts software and machine learning to bear on the problem. Co-founder and CEO Alexander Rinke says that his company deals with massive volumes of data and moving all of that to the cloud makes sense. “With Intelligent Business Cloud, we will unlock that [on prem data], bring it to the cloud in a very efficient infrastructure and provide much more value on top of it,” he told TechCrunch. The idea is to speed up the whole ingestion process, allowing a company to see the inefficiencies in their business processes very quickly. Rinke says it starts with ingesting data from sources such as Salesforce or SAP and then creating a visual view of the process flow. There may be hundreds of variants from the main process workflow, but you can see which ones would give you the most value to change, based on the number of times the variation occurs. By packaging the Celonis tools as a cloud service, they are reducing the complexity of running and managing it. 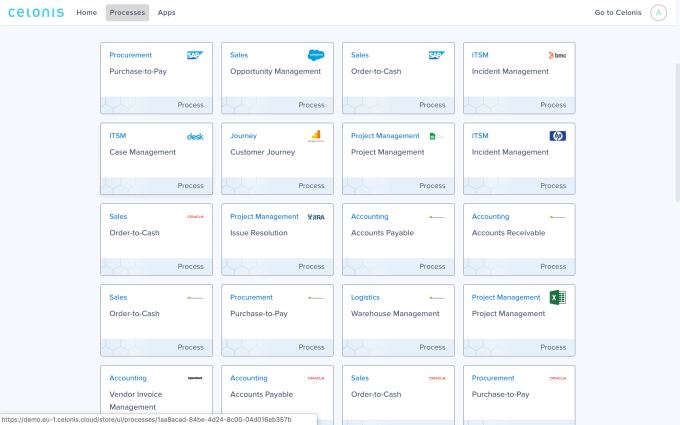 They are also introducing an app store with over 300 pre-packaged options for popular products like Salesforce and ServiceNow and popular process like order to cash. This should also help get customers up and running much more quickly. The cloud service also includes an Action Engine, which Rinke describes as a big step toward moving Celonis from being purely analytical to operational. “Action Engine focuses on changing and improving processes. It gives workers concrete info on what to do next. For example in process analysis, it would notice on time delivery isn’t great because order to cash is to slow. It helps accelerate changes in system configuration,” he explained. The new cloud service is available today. Celonis was founded in 2011. It has raised over $77 million. The most recent round was a $50 million Series B on a valuation over $1 billion.